We went to PAX on Saturday! 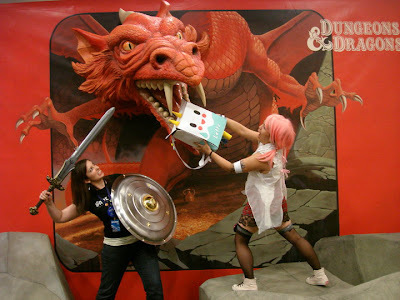 For those who dont know, PAX is the Penny Arcade Expo which basically is the Video Game Convention for geeky Seattle. WOOHOOOO for the OVER 52 THOUSAND people who showed up!!! We completed a quest, acquired some PHAT LEWTS and defeated a DRAGON! Ava tanks the beast while Rini deploys a creative offensive strategy. Symbiote Studios sent us on a quest! We had to run around the exhibition halls and advertise for Symbiote at different vendors. As a quest reward we got toys from Symbiote! Symbiote actually makes some cool stuff, they are working on Fraggle Rock figures now! Symbiote gave us a Dr Tran and a Ninja toy. Who's Dr Tran? Apparently it's a YouTube hit. Off to YouTube I go once I'm done here. 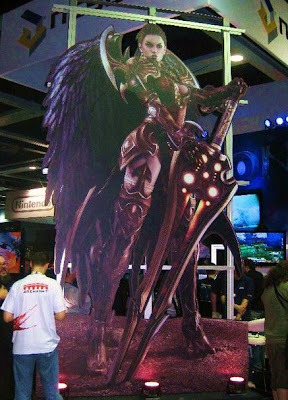 This is a the biggest cardboard standee ever. It's a Deiva (demi-goddess) named Aiva from the MMORPG Aion. If I had serious skills I would love to do this as a costume! Ironically my latest main character in WoW was actually named Aiva (Ava and Avalyn were already taken on the Gorgonnash server) but when I played Aion I used a different name. This might just be my favorite giant prop in the exhibition hall - the area dedicated to a new game called Rift had some weird giant plant conglomoration handing from the ceiling with fruity orbs pulsing with faint illuminescence amid a mass of floral and vines.